Fourth industrial revolution it's involving not only technologies but also manufactures whit major changes and challenges. It is not only a thinking revolution but also in how to act: companies shall have to be able to fully satisfy all their customers desires at any time. Results: we get higher expectations from customers than the quality of service and a real corporate profitability increase. More and more digital, more and more social, taken from the vortex of constant improvement we emotionally and physically turned away from the people around us, people with whom we should maintain working relationships but also friendship and cooperation. 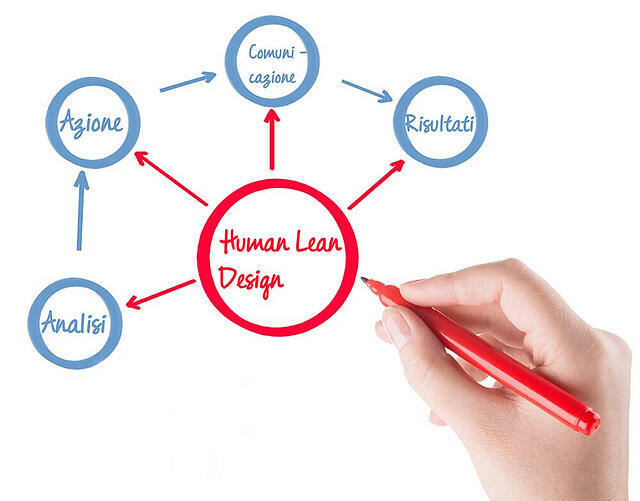 That's why in the Age of the reports, the Human Lean Design® sets Man at the center of its system , the man who establishes relationships with others and so promotes communication, management of information flow and relations. Positive and proactive relationships, favourable to the development of the market, profitable for research and simple to ensure clarity and transparency. The core of all remains the final customer, the one who can express its dedication to the perceived values of your company. Make the customer directly partner of the activities within your company, it allows you to carry out a huge enterprise Value Added. We start from the production processes, make them lean and effective taking into account the internal relations. The approach Human Lean Design® argues that respond to an increasingly competitive market is only possible by eliminating all activities that do not bring added value in production processes. This means removing all the waste, and then rearrange rationally all activities, transforming the company into a real fully functional, high-performance eco-system. We examine the company's value from the customer's point of view, identifying all those activities that do not generate more value, along with all the organization's processes. The analysis allows us to have a clear overview of the situation to be able to define the most effective strategies. We map all activities to identify the best strategy to achieve continuous improvement. We organize the project with appropriate resources, with operational and decision-making autonomy, and we have great perseverance in managing change. respecting people and their work. We build unique relationships within the company and we value the incomparable human qualities leading them to make the most of an organization synchronized. We add value to your company reducing loss and providing greater satisfaction to the final customer. In this way we get with you two advantages: higher customer expectations with respect to service quality and measurable increase in corporate profitability.